You use a monster monitor capable of 1600x1200 or better. The main thing you want from your X is as many lines of Emacs buffer as can fit on the screen without causing eyestrain. You like to have your key tools (xterm, Emacs, web browser) on a handy but unobtrusive toolbar along with biff, a clock, and a load meter. You like to overlap windows as little as possible so you're not distracted by panel-shuffling when you change windows. You find using virtual desktops tends to leave you disoriented and wondering why everybody thought this was a neat feature. You don't need your desktop to make a fashion statement -- you want a spare, clean design that gets the job done. Eric's Big Blue-Steel Desktop is basically designed to treat your screen as a two-page display, with Emacs on the right and a couple of xterms (or a Web browser) and the toolbar and icon dock on the left. Font sizes are carefully chosen to be as large as can be consistent with this layout. Here is the .fvwm2rc file that sets it up. It has been commented, with relevant X resource settings explained, so you'll find it relatively easy to modify. Here is the .xinitrc I used with it. If you find you like this design, either as-is or as a basis for your own hacks, drop me a line. 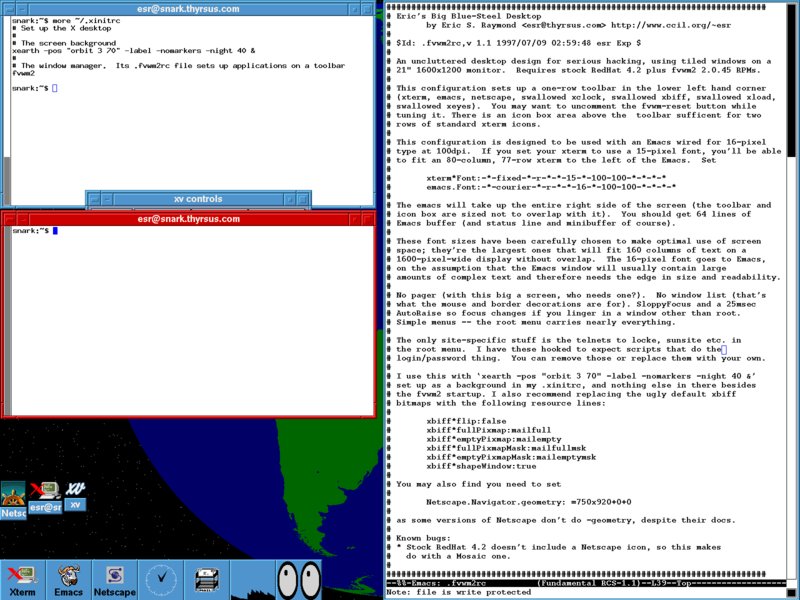 (I still use a very similar layout under GNOME).